A courtesy name (Chinese: 字; pinyin: zì; literally: 'character'), also known as a style name, is a name bestowed upon one at adulthood in addition to one's given name. This practice is a tradition in the Sinosphere, including China, Japan, Korea, and Vietnam. Formerly in China, the zi would replace a male's given name when he turned twenty, as a symbol of adulthood and respect. It could be given either by the parents or by the first personal teacher on the first day of family school[clarify]. Women might adopt a zi in place of their given name upon marriage. One also may adopt a self-chosen courtesy name. In China, the popularity of the custom has declined to a large extent since the May Fourth Movement in 1919. A courtesy name is not to be confused with an art name (hào, Chinese: 號, Korean: 호), another frequently mentioned term for an alternative name in Asian culture-based context. An art name is usually associated with art and is more of a pen name or a pseudonym that is more spontaneous, compared to a courtesy name. The zì, sometimes called the biǎozì（表字）or "courtesy name", is a name traditionally given to Chinese males at the age of 20, marking their coming of age. It was sometimes given to females upon marriage. The practice is no longer common in modern Chinese society. According to the Book of Rites, after a man reaches adulthood, it is disrespectful for others of the same generation to address him by his given name, or míng. Thus, the given name was reserved for oneself and one's elders, while the zì would be used by adults of the same generation to refer to one another on formal occasions or in writing; hence the term "courtesy name". The zì is mostly disyllabic, consisting of two Chinese characters, and is usually based on the meaning of the míng or given name. Yan Zhitui of the Northern Qi dynasty believed that while the purpose of the míng was to distinguish one person from another, he asserted that the zì should express the bearer's moral integrity. It is also common to construct a zì by using as the first character one which expresses the bearer's birth order among male siblings in his family. Thus Confucius, whose name was Kǒng Qiū (孔丘), was given the zì Zhòngní (仲尼), where the first character zhòng indicates that he was the second son born into his family. 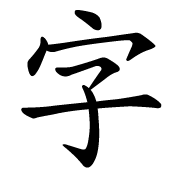 The characters commonly used are bó (伯) for the first, zhòng (仲) for the second, shū (叔) for the third, and jì (季) typically for the youngest, if the family consists of more than three sons. General Sun Jian's four sons, for instance, were Sun Ce (伯符, Bófú), Sun Quan (仲謀, Zhòngmóu), Sun Yi (叔弼, Shūbì) and Sun Kuang (季佐, Jìzuǒ). Prior to the twentieth century, sinicized Koreans, Vietnamese, and Japanese were also referred to by their zì. The practice was also adopted by some Mongols and Manchus after the Qing conquest of China. ^ Tianjun Liu, Xiao Mei Qiang (2013). Chinese Medical Qigong. p. 590. ISBN 978-1848190962. Mencius (371—289 BCE), born in Zou county (Shandong province), first name Ke, style name Zi Yu, was a famous philosopher, educator, politician, and expert on the Qigong life nurturing of Confucius in the Zhanguo Period.